Lately, I’ve seen the familiar signs of back-to-school. The school bus noisily pulls away from my neighbor’s house before the sun has fully risen. The neighborhood kids are inside a bit earlier in the evening (probably to finish that pesky homework), and I see throngs of students walk down the street with heavy backpacks slung low over their shoulders. But there are a few new signs in my neighborhood that school is back in session; kids with dirty jeans, mud stained at the knees from time spent in the school garden. Interest in school gardens in California is high, and institutions are working to provide the resources to make school garden development a success. The UC Davis Children’s Garden Program, in collaboration with Life Lab Science Program and the Resource Conservation District of Greater San Diego County, has been working for over a decade to train those who wish to start school gardens that can provide positive experiences for students, but can also serve to enhance academics in the classroom. The workshops are intended to give communities the capacity to start their own school gardens while focusing on long term efforts to keep the gardens alive and thriving. The Creating and Sustaining Your School Garden workshops teach the nuts and bolts of starting a garden, but also provide trainees with curriculum designed to bring many state-mandated education requirements into the garden. Beyond just a site for planting and harvest, the garden can be used, for example, as a space for young children to practice math skills like measuring, for middle school students to study civilizations of the world and for high school students to work on culinary arts, agricultural skills and entrepreneurship. Between 2012 and 2014, the workshops aim to train approximately 700 school educators from throughout California. 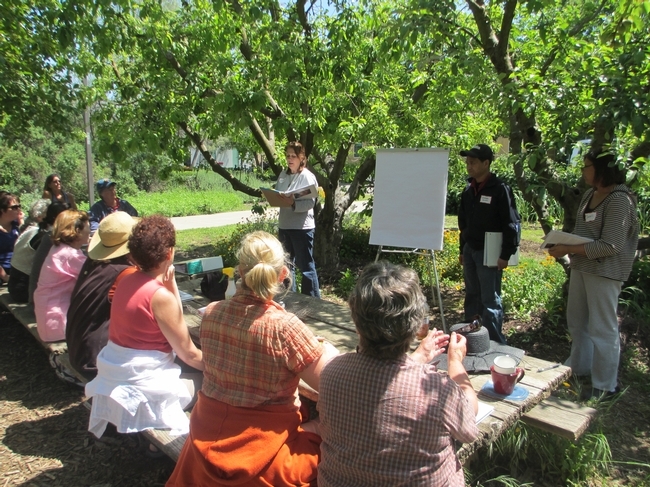 Additional “Train the Trainer” workshops seek to widen the circle further, providing mini-grants to organizations and schools interested in providing their own trainings on starting gardens. Carol Hillhouse, director of the UC Davis Children’s Garden Program, housed at the Agricultural Sustainability Institute, has been creating and teaching garden-based learning since 1992. Between 2007 and 2008, the workshops trained 180 trainers, who went on to train an additional 664 people in the practice of starting a school garden. The participants in those workshops represented nearly 300 schools, with a school population of 93,879. Participation in this year’s workshops is expected to yield similar results. The sustained level of interest in these workshops and in school gardens in general over the years has been impressive. School budget cuts, threats to school programs and teacher salaries are a grim reality in California. But in the face of those challenges, school garden interest seems to grow. Still, gardens are not yet institutionalized within school budgets, and so their success depends on staff members, community and parent volunteers. Hillhouse advocates for gardens becoming more than expendable extras within schools. “We still need additional research in this area but I know they can be very impactful. Over the long term they provide experiences for children that develop into a richly-scaffolded understanding of agriculture and food," she said. Creating and Sustaining Your School Garden workshops along with workshops in other topics will be offered several more times around the state between now and June of 2014. Visit the UC Davis Children’s Garden Program website for information on dates and locations as they are scheduled and links to workshop registration. Here in Stanislaus County we are especially thankful for the support of all organizations. Carol and her training group did a fantastic job teaching us the ropes. We are excited feel prepared to do our first workshop next month!